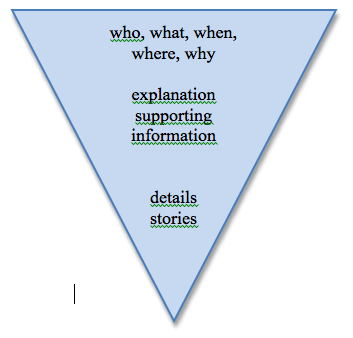 The inverted pyramid is a traditional news structure. When the story needs to be shorter to fit the column inches available in the newspaper, the editor can begin cutting at the bottom. 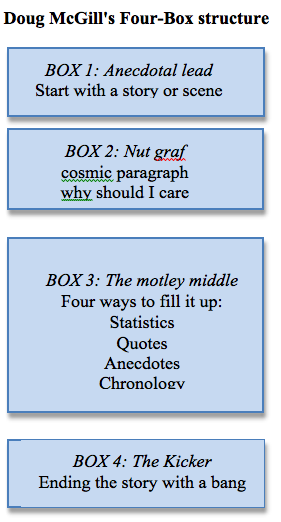 Doug McGill’s four-box structure provides an alternative way to organize stories. The middle part of both stories includes material such as statistics, quotes, anecdotes and chronology. Some of this material might also go in a sidebar. Or it might be presented in a graphic, such as a chart or graph. These are two different ways to organize stories. There are other ways. What’s important is to have an organization that makes sense for your story. Which format would you choose for each of the following articles, and why?